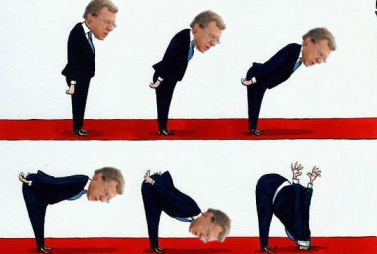 Kudrin was asked to clarify what he means by “halfway”. He employs spokesmen at the Accounting Chamber and at a political organization he maintains called the Committee of Civil Initiatives. The latter, established by Kudrin in 2012 following his dismissal as finance minister, describes itself as “united around the idea of modernization of the country and strengthening of democratic institutions.” Every year, the Committee runs surveys of regional conditions, monitors the press, and organizes conferences of political organizations backing Kudrin. To selected local activists, the Committee also awards annual prizes of cash and a figurine, the Golden Sprout. This is Kudrin’s permanent campaign organization. It does not disclose its source of money except for the posting of its “special gratitude” to Norilsk Nickel, controlled by Vladimir Potanin and Oleg Deripaska. Publicity shot of Alexei Kudrin in front of his supporters at the Committee of Civil Initiatives. A list of his principal supporters can be opened here. Kudrin was asked: what did he mean by his reference to geopolitical disagreements? What is his proposal for the Russian offer in talks with the US? What does he mean by “other means”? and, concretely, what is meant by “meet each other halfway” — half of Crimea to go back to Ukraine? Half of Syria assigned to Israel and Turkey? half the Kuril islands to go to Japan? Kudrin’s offices at the Chamber and the Committee said he would not answer by telephone, and requested emails. The questions were sent. By telephone both offices confirmed receiving the emails. Kudrin refuses to answer. A year ago, when Kudrin was publicly pressing President Vladimir Putin for a post in the new government with special powers to negotiate with the US, he outlined a plan of attack on the Russian Defence Ministry and General Staff — cutting Russia’s military budget, defence capability, and commitments to Crimea and the Donbass. This was in statements given on his behalf to a London newspaper; Kudrin avoided making them himself in Russia. For details, read this. In May, when his campaign for political promotion had failed, Kudrin retracted his views in a speech to the State Duma in order to secure votes for confirmation of his Accounting Chamber job; click to read. The vote against Kudrin was the highest ever against a presidential nominee for Chamber chairman. Kudrin’s ranking in national opinion polls is on the top-10 most distrusted politicians in the country. The principal target of Kudrin’s campaign remains the Russian military leadership. General Valery Gerasimov, Chief of the General Staff, has responded with a detailed outline of Russian strategy against the US. His speech entitled “Vectors of Development of Military Strategy” was delivered to the Academy of Military Sciences. The full text can be read in Russian here and in English here. This is the first explicit identification by the Russian General Staff of Venezuela alongside Ukraine and Syria as a target of US war which it is in Russia’s strategic interest to oppose. Coordination of Russia’s defence resources, according to the General Staff, requires that measures to counter US economic sanctions, media and cyber operations against Russia and its allies, including domestic subversion, should be directed by the General Staff.